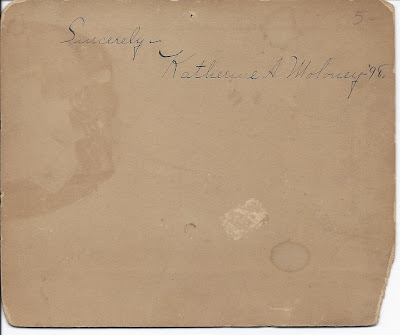 The photograph above, taken by the Sanford studio at North Adams, Massachusetts, has an inscription on the reverse: "Sincerely, Katherine A. Moloney - '98" . Searching online, I found a marriage for a Michael Moloney and Mary Coday (or Cody) on July 31, 1871 at Adams, Massachusetts, but I'm not sure if they were the parents of Katherine above. If so, her parents were both born in Ireland: Michael about 1844, and Mary about 1845. Michael's parents were David and Catherine Moloney, both born about 1813 in Ireland. Mary's parents were James and Margaret Cody, both born about 1820 in Ireland. Michael and Mary had a son David, born 25 November 1872 at Adams, Massachusetts. They also had a daughter Catherine born in 1877, died 3 November 1877. The Katherine above may have been named for this deceased child. 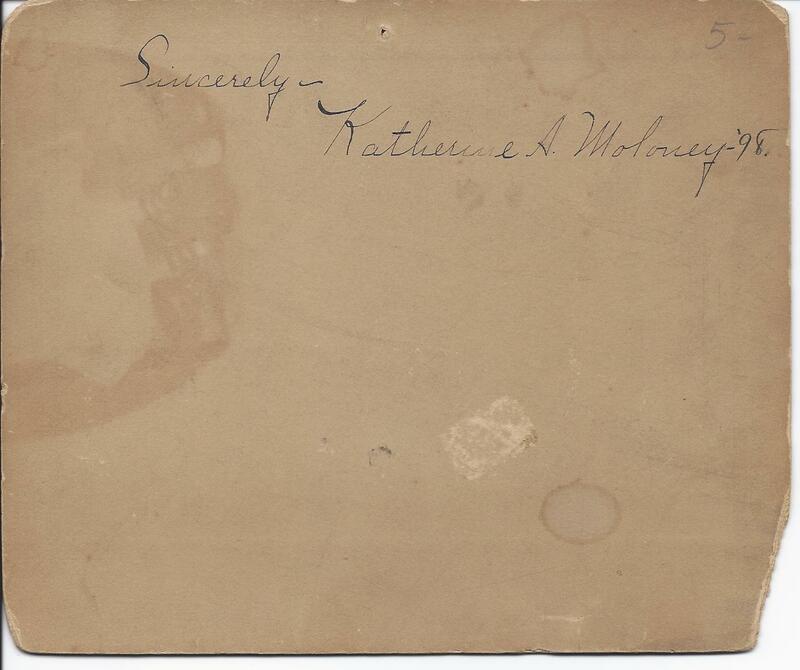 If you have any theories as to the family history of Katherine A. Moloney, please leave a comment or contact me directly. Thanks! 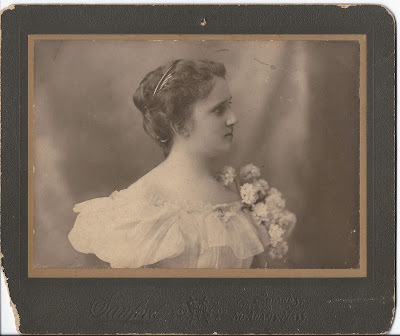 This photograph was found with that of another taken at North Adams, likely a classmate, Grace MacDougall. And she apparently remained single, as she applied for a passport as Katherine Agner Maloney in 1923. I'm not even going to start on all nine of the Concord HS graduates, well not right now anyway :). Looking at the passport, the Katherine Agner of Great Barrington spelled her last name as Maloney. It's possible she had come to spell it that way by 1925. The 1900 Census of Great Barrington has this Katherine as the daughter of John and Catherine Maloney. So is the woman in the photo Katherine the daughter of John and Catherine Maloney, or Katherine the daughter of Michael and Mary Moloney? Hopefully a member of the family will come across this post and weigh in. Yes, I think you're right, Catherine. A graduation portrait and a very classical pose. Thanks for taking the time to comment!